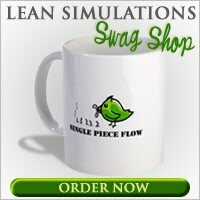 Lean Simulations: The U-shaped Manufacturing Cell - Slow down to become more lean. The U-shaped Manufacturing Cell - Slow down to become more lean. Linking work cells together is the best way to reduce work in process and improve work balancing. Last time, I posted a video of a valve maker putting three pieces of machining equipment together. The reasoning behind their use of a U-shaped cell was to improve throughput. But what if you don't need to go faster? You don't want to succumb to the waste of overproduction! When the takt time for your customer is slower than your process cycle time, you may need less operators than machines. One operator will have to run multiple machines. Assuming you're not using the machines for any other product - special purpose machines - you should try to level production across your available working time. Level production, or heijunka, is one reason you might change to a U-shaped cell. By balancing your tasks so that your cycle time meets your customer takt time, you may need to run slower, with less operators. Sometimes you just have to slow down to be more efficient. Look at the following video of one man running multiple machines. Actually, there are two videos in the clip below. The first part shows an operator working in a U-shaped work cell by himself, while the second part shows two, maybe three, operators working in a different U-shaped cell. The work cells contain multiple machines. You could throw in a few more operators and increase throughput significantly, but maybe you don't need to. One operator works one machine, then moves on to the next, while the first machine is running. In the second half of the video, the operators carry their heavy parts on something that looks like a cafeteria tray, just sliding it along to each machine. In U-shaped cells, the operators can be balanced across different machines. One operator can run 1 machine, while another runs 3. Depending on the work load, you have options. Why does it have to be a U-shape? Technically, you can achieve some of the same gains working in a straight line. Automakers have made cars in straight lines for years, however, those lines move while the operator stays in the same place. The benefit of the U-shape is that the operators can cross over onto the other side of the work cell. This allows them to end up in the same place as they started. Look closely around the 0:54 second mark. The operator moves the tray down the line, then crosses over to pick up the part on the opposite side. Then he works on the opposite side until he gets back to the start again, where he'll cross back and begin the cycle again. Of course, there's always room for improvement. In the videos above, there's a lot of walking. Can the machines be placed closer together? Who knows. They look pretty big, so I expect it would be an expensive relocation. It appears that he could be traveling too far, so when he crosses over he has a long walk back. The operator in the distance would be doing the same and there may be an opportunity to create a closer cross-over point. Does anyone else have experience with U-shaped cells? Does anyone else get dizzy walking in a circle all day? The core idea of lean manufacturing is to relentlessly work on eliminating waste from the manufacturing process in order to maximize value for customers. Simply, the lean goal is that every activity that uses resources must create value, such as less time, movement and cost.